It's Facebook IPO Day! Now What? Today's the day. It's Facebook (NAS: FB) IPO Day! See what I did there? I bolded "Facebook" and added a ticker to it, something we can only do with public companies. Investors have been waiting for years for me to be able to do that. The offer priced last night at $38, valuing the social butterfly at $104 billion, a.k.a. the largest IPO of all time. That's at the top of the upwardly revised range of $34 to $38 per share, after bumping that up from the initial ballpark of $28 to $35. The company is selling 484.42 million shares to the eager public, and at $38 a pop that comes out to $18.4 billion in capital going into Facebook's coffers. 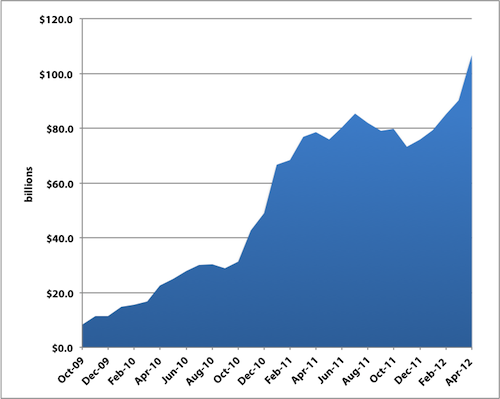 That still trails behind the $19.7 billion that payment processor Visa (NYS: V) raised in its 2008 IPO. Private stock exchange SecondMarket has kindly shared historical pricing data for how the company's shares have traded over the past few years. 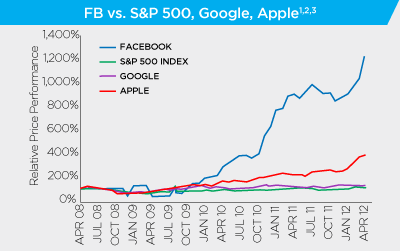 Here's how Facebook's valuation has skyrocketed over the past few years on the private market. That performance even handily trounces the likes of Apple (NAS: AAPL) , which has unarguably destroyed the market much as it destroys analyst estimates. The private exchange also tracks data on who's doing the trading, with more than half of buyers being either hedge funds or asset managers. Just 14.8% were accredited individuals looking for a piece of the social networker. Keep in mind that "accredited" means those individuals have to meet certain financial requirements, such as a net worth exceeding $1 million or annual income of at least $200,000 in each of the two previous years (or $300,000 joint income with a spouse), and certify that they know how to invest in illiquid securities. On the seller side, the bulk of sellers were former employees at 79%, while early investors comprised 12.4%. 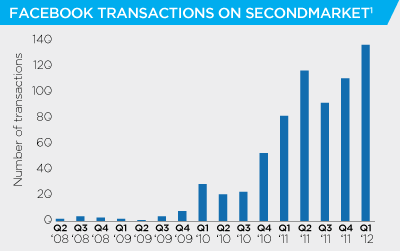 Facebook saw its number of transactions steadily rise as interest snowballed in the past few years, and while that means more liquidity, that's still very much illiquid any way you slice it. At the peak, which was the most recent quarter, we're still talking about only 137 transactions during an entire quarter. By just about any measure, Facebook had quite an incredible private run. But that was then, and this is now. Will the largest social network in the world be able to translate that success into public triumph? At this point, instead of needing a $1 million net worth or $200,000 in annual income, any Joe off the street with $100 in his pocket can potentially buy in. From here on out, instead of having to answer to a handful of private investors, Mark Zuckerberg will be tasked with appeasing millions of public investors who will want to have his head if he makes a mistake. He'll be scrutinized by industry watchers and regulators at the SEC. He'll need to be mindful of the all-important "consensus estimate" every time Facebook publicly reports quarterly earnings results. The $100 billion question on everyone's minds is whether or not Facebook can live up to its lofty valuation and triple-digit P/E. Even though Facebook has generated less than $1 billion in net income over the past four quarters, it has a massive user base that shouldn't be taken lightly. All Facebook needs to do is figure out how to better monetize all those Facebookers who are hooked on "liking" and commenting on the site. The newest Wall Street metric: "likes." I bet you never thought you'd see the day when the Street would care how much you "liked" that adorable photo of your wife's cousin's newborn baby. Well guess what? Today's that day. As one of the metrics that Facebook tracks as a proxy for engagement, the Street and advertisers alike will be keeping an eye on that figure to see whether all those Facebookers are still paying attention. At the time this article was published Fool contributorEvan Niuowns shares of Apple, but he holds no other position in any company mentioned. Check out hisholdings and a short bio. The Fool owns shares of Apple.Motley Fool newsletter serviceshave recommended buying shares of Visa and Apple and creating a bull call spread position in Apple. The Motley Fool has adisclosure policy. We Fools don't all hold the same opinions, but we all believe thatconsidering a diverse range of insightsmakes us better investors. Try any of our Foolish newsletter servicesfree for 30 days.